I am happy to introduce the latest issue of the Regional Cooperation Council (RCC)’s Roma Integration 2020 (RI2020) Newsletter, summarizing the key achievements of the project during 2018. This month, a major step has been initiated at our Task Force meeting in Skopje, when the governments of the EU Enlargement region agreed to work on a Regional Declaration and enhance efforts for full equality and integration of Roma. The Declaration is expected to be endorsed by the Ministers responsible for Roma integration in the enlargement region at a high level event scheduled for spring 2019, to be hosted by the Prime Minister of The Former Yugoslav Republic of Macedonia and the European Commission. During 2018, the project provided hands-on-experience to our government partners to complete the 2017 monitoring reports on the implementation of their Roma Integration Strategies and Action Plans in the region, which you can find on our website.The governments of Turkey and The Former Yugoslav Republic of Macedonia were also supported to improve their Roma Integration Action Plans. Further, we have established a regional working group to develop guidelines for Roma responsible public budgeting. After one year of budget analysis in the region, Guidelines for Roma Responsive Budgeting were prepared (and will be available on our website soon).The Guidelines should assist governments to better incorporate Roma integration policies in public budgets and allocate necessary resources to ensure effective integration of Roma. The Guidelines will be tested next year during the budget preparations for the year 2020. Four regional conferences were organized in 2018 on the topics of addressing discrimination and Anti-Gypsysm, holistic approach to housing in the enlargement region, economic (in)dependence of Romani women, and innovative approaches to employment of Roma. Conclusions from the conference "Holistic Approach to Housing of Roma in the Enlargement Region", together with the comparative legal analysis of housing legislation in the Western Balkans Region are incorporated in the report "Targeting Roma in Housing Policies of the Western Balkans". The work of the RCC’s RI2020 will continue, as our project will launch its Phase II from January 2019. The Phase II will focus to ensure Roma integration policies produce the desired results for Roma communities by developing concrete actions, especially in relation to housing legalization and formalization of undeclared work. The Phase II will further develop regional standards for including Roma integration in mainstream policies, tackling effective employment measures for Roma and negative narratives of public. By introducing these novelties, the project impact will move beyond institutional setting and policy definition and have a stronger effect in the field. To further support the monitoring process, we will develop an online reporting tool that will be piloted in 2020. We look forward to continuing our cooperation on this important assignment. The Regional conference on innovative approaches to employment of Roma, jointly organized by the RCC’s projects RI2020 and Employment and Social Affairs Platform (EASP) with Roma Education Fund (REF) was held in Budapest on 10 and 11 December. The overall goal of the conference was to examine and propose employment measures for Roma that may contribute to the reduction of the gap between the employment rate of Roma and the general employment rate in the enlargement region. This regional event brought together around 50 government officials, including National Roma Contact Points (NRCPs) from the EU Enlargement region, representatives from the public employment agencies and the ministries from the EU enlargement region dealing with the area of employment/social welfare, education and local self-government, representatives of civil society organizations, and international organizations including UNDP. The Third Task Force Meeting of the RCC’s RI2020 took place on 04 December in Skoplje, gathering the NRCPs, civil society representatives, representatives of the European Commission, Open Society Foundations and the RCC. The Task Force decided that the governments will continue the practice on annual reporting on implementation of Roma integration policies. The region’s governments still need the support from the RCC to improve the internal monitoring and reporting procedures, particularly in establishing coherent monitoring system for regular collection of output and impact data, building capacities to analyse and produce relevant reports and to utilize the data for the different reporting requirements. Furthermore, the need to digitalize the monitoring and reporting process was identified. Regional standards for monitoring and reporting of Roma integration process, developed within the RI2020 project, will be further promoted. The topics of employment and housing will be given priority as they are the currently the least developed areas. The legalization of informal settlements and formalizaton of undeclared work across the enlargement region will be promoted as primary solutions in this regard. The Working Group for Developing Regional Standards for Roma Responsible Budgeting, comprising of the NRCPs, representatives of Ministries of Finances from the economies in the enlargement region, RCC’s RI2020 Action Team and independent budget experts, elaborated Guidelines for Roma Responsive Budgeting. By applying these guidelines, the governments of the Western Balkans will be able to incorporate and deliver specific Roma integration goals in their mainstream policy developments by means of establishing links between the Roma integration goals and national budgets. This way, the mainstream socio-economic policies can be made more sensitive and responsible to the needs of Roma as well as properly budgeted and implemented. The regional conference on the economic situation of Romani women in the enlargement region, organized by the RCC’s RI2020 Action Team in cooperation with the Government of Serbia and CARE International Balkans, was held in Belgrade on 31 October and 01 November. During the two days, more than 130 government officials, representatives of civil society and international organizations from the enlargement region heard about the data and the measures to improve the situation of Romani women in employment across the region, especially related to the issues of Roma health mediators, causes of economic dependency from early childhood and youth such as obstacles for education, early marriages and pregnancies, lack of professional orientation, child labour and begging and early socialization of Romani girls. The RCC’s RI2020 Action Team prepared a set of recommendations to resolve the housing situation of Roma in a sustainable way and contribute to the progress of full realisation of fundamental rights of Roma. The report was shared with participants of the 2018 EU Platform on Roma Inclusion, organized by the European Commission on 8 and 9 October in Brussels. The main step in improving policies for complete and sustainable integration of Roma in the region is introduction of a new approach to the housing needs which would encompass a full package of support services related to employment, education, health, non-discrimination and equal access to services. 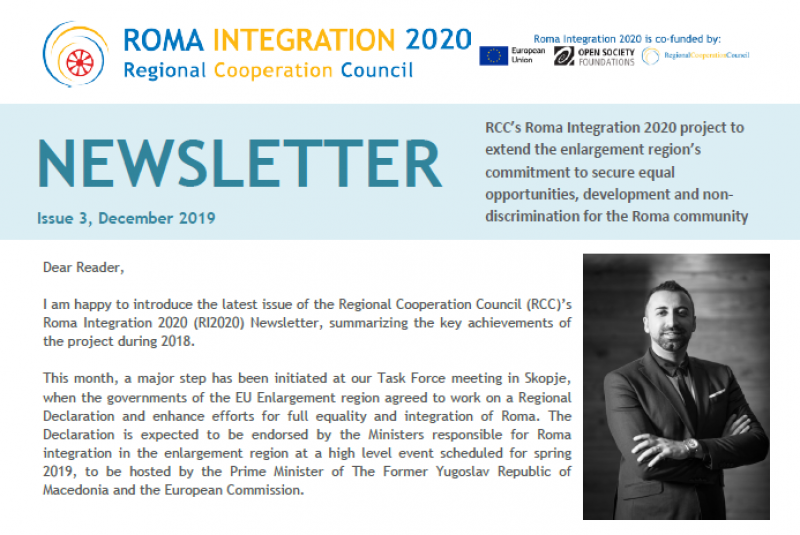 National Platforms on Roma Integration, annual discussions on Roma integration policies involving relevant public officials, local level officials, Roma civil society and other relevant stakeholders, were successfully organized in 6 regional economies participating in the RCC’s RI2020 project during 2018. In the following years, the RCC’s RI2020 will extend its support in assisting to the governments in dialogue facilitation in order to better integrate policy measures targeting specific Roma integration goals into mainstream socioeconomic policies and plan central budgets.